David W. Blight is Professor of History at Yale University; he taught at Amherst College for thirteen years. His scholarly work is concentrated on nineteenth-century America, with a special interest in the Civil War and Reconstruction, African American history, and American intellectual and cultural history. 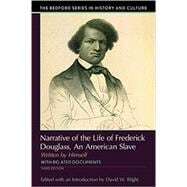 He has lectured widely on Frederick Douglass and served as a consultant to documentary films on African American history, including the PBS television film Frederick Douglass: When the Lion Wrote History. His book, Frederick Douglass' Civil War: Keeping Faith in Jubilee is an award-winning intellectual biography of Douglass and a study of the meaning of the Civil War. His work Race and Reunion: The Civil War in American Memory was awarded the Bancroft Prize in American History, the Lincoln Prize, and the Frederick Douglass Prize, as well as four awards from the Organization of American Historians. He is the author of numerous essays on abolitionism and African American intellectual history, and his latest work is a collection of essays entitled Beyond the Battlefield: Race, Memory, and the Civil War.